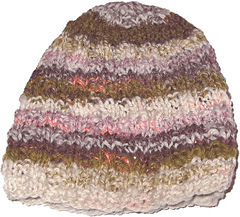 Simple waffle weave stitch creates a textured hat that fits closely to the head without stretching out and shows off handspun yarn nicely. 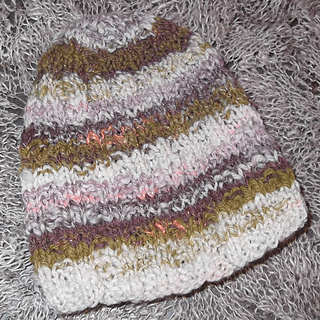 The four row pattern is easy to memorize, and the hat uses just 75 yards of yarn. 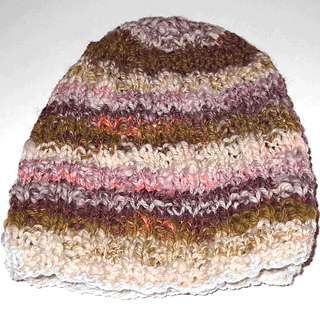 The decreasing at the top of the hat is designed to maintain the waffle weave stitch pattern for as long as possible without distorting the purl bump rows. Baby- 6 inches high, stretches from 12-16 inches around. Intermediate- Need to know how to decrease and work on double pointed needles. 5 stitches/inch in waffle weave pattern. 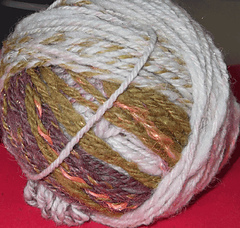 You can substitute a dk or light worsted weight yarn for the handspun. You can use self-striping, hand dyed, or solid- the more solid colored the yarn is, the more the waffle weave pattern will show up. You can watch a stop motion video of how this pattern was written here.